“Under love’s heavy burden do I sink,” said Romeo. No such thoughts, however, for the fine brigade of men gathered in front of me today. Super Mario, a man, let me remind you, who once sprinted across the Mushroom Kingdom in under 5 minutes whilst dodging life-sized bullets during the rescue of his Princess, smiles for the camera. Elvis Presley, the King who once lifted his bride Priscilla across the threshold whilst singing The Hawaiian Wedding Song, looks similarly unfazed. Only the man dressed in a leopardskin leotard (Captain Caveman?) seems a little preoccupied. Fears of bounding the pitch? Perhaps he has simply mislaid his club. It’s a bizarre congregation, one to which the habitants of a sleepy village of 4000 people in the middle of the Finnish countryside, are accustomed. 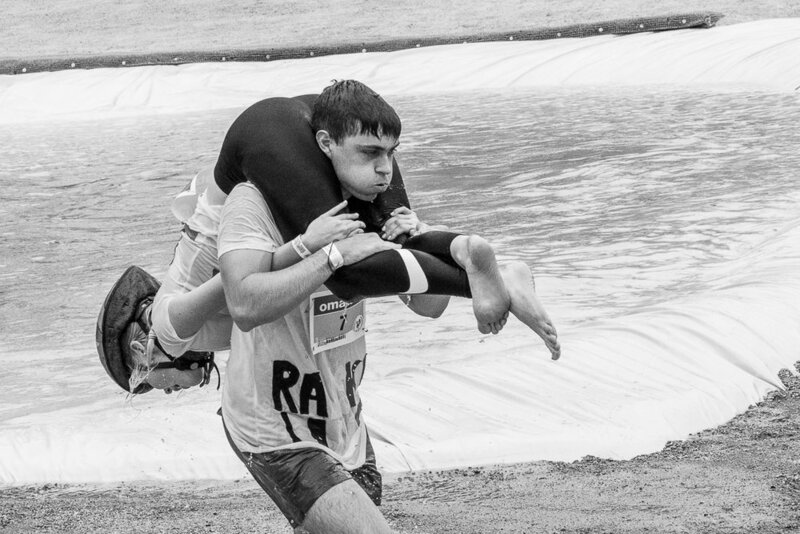 Each July, for the last 26 years, the world and his wife (excuse the pun) descend on Sonkajärvi for the World Wife Carrying Championships. 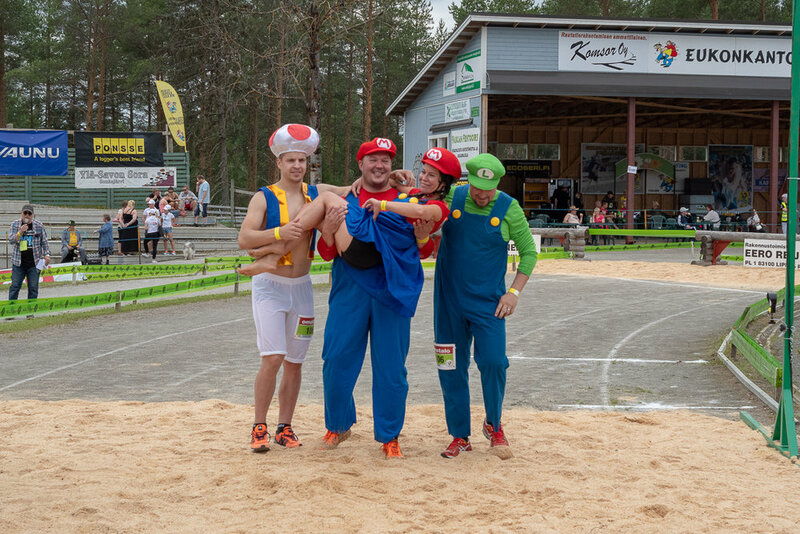 Wife Carrying (or Eukonkanto, to give it its full name) is a tradition that late 19th century criminal ‘Ronkainen the Robber’ unwittingly started after his strict gang selection criteria became legend. To join his band of merry men the applicant had to navigate a course whilst carrying a load of suitable heft, a live pig, or one’s spouse, for example. The modern variation, for understandable reasons, permits only the latter. I have prime spot next to the VIP seats opposite the water feature. Over the course of the next hour I witness men perform rough duty to their wives as they grunt, bump and grind their way across the 250m course. 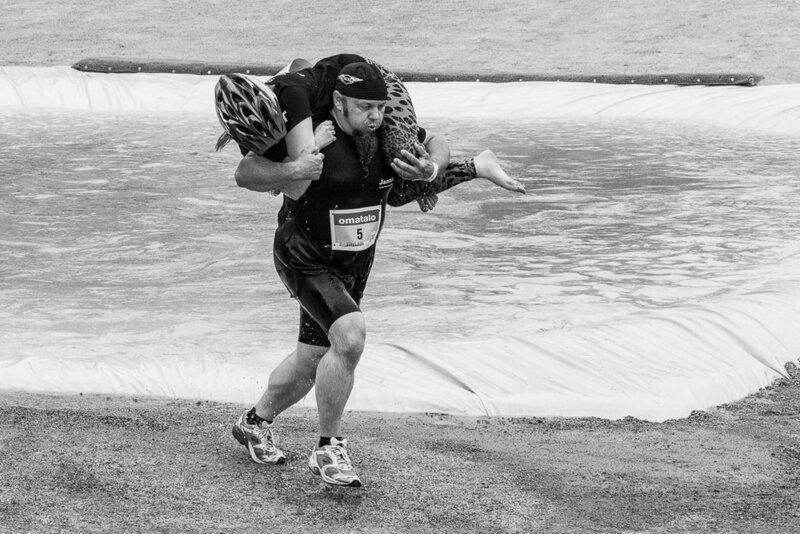 There are innumerable techniques ranging from the fireman’s lift to the piggyback but the most common is the “Estonian Carry”, a method as unflattering to the wife as is effective to the husband. It involves the woman lying face-down across the man's shoulders, feet forward, grabbing her own legs from under his armpits. Energy spent staying aboard is thus expended by the luggage, not the porter. Some seem to relish the proceedings, revelling in the ridiculousness of it; one woman gives the peace sign to the press as her husband battles forth. Others may wish they had adopted better technique as they drop unglamorously into the ditch. Lithuanian super-husband Vytautas Kirkliauskas and his spouse are the most effective and harmonious duo. A wife is no burden for this exemplary husband. His technique, it should be noted, is as impeccable as his charm.